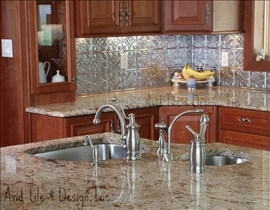 We have often noted that a modern kitchen is very different from the older types. Kitchens have now become a place where people not only prepare food and cook but also use as a part of a dining/ entertaining area as well as storage area. A kitchen typically includes a stove, a sink with cold & hot running water, a refrigerator, a dishwasher, other gadgets and some cabinets some of which may be under the countertop. The first thing in a kitchen which attracts people's attention is the countertop, which could be made of a marble, granite or recycled glass material. Marble is one material which has been in use for a very long time. Marble countertops are very appealing but often suffers from discoloration or cracks easily due to the impact of falling objects. Marble is full of life because light can penetrate a few millimeters into top surface. Natural or cultured marble can also be used. With many colors and designs, marble countertops are fairly popular. Marble countertops have the advantage of being resistant to heat and temperature. 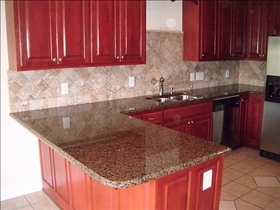 Stronger and more expensive than marble, granite is the favorite choice of many experienced home owners. If the color is black, it is very striking and gives the best visual impact in the kitchen. Cleaning it is never a difficult task. One wipe and the entire mess can be cleaned. Granites are the hardest countertop types. The unique aspect of them is that they have the same design no matter in how many pieces it has been broken into. Cleaning is fairly easy but a good sealant is required to prevent damage over time. Recycled glass is a glittering alternative to granite and marble countertops in a kitchen which has evolved into a place of cooking, eating and living. We are also saving on costs because we recycle glass materials and thus save our scarce resources on planet Earth. They are hard and more prone to having a long life even though appear to be delicate. The exclusive appearance combined with strength makes it an impressive fixture in the kitchen. They are flexible in terms of sizes and shapes in oddly shaped kitchens especially. Made to order, color matching is possible and recycled glass, or quartz, countertops are the newest craze in kitchen design. The level of satisfaction that you require from the type of countertop placed is by the kind of impact you want it to have in your kitchen in terms of appearance and the maintenance required to keep it in the same condition for many years to come. As you are probably very aware, there have been on-going accusations that have been consistently made against natural granite products having the ability to cause cancer, because of the high levels of radon that they have been said to produce. These accusations have been going on for quite a while, and it is time to put them to rest. Who better to accomplish this, than professionals who strive to ensure the safety, as well as the satisfaction of all customers? The National Stone Restoration Alliance is ready to put accusations to rest. Josveek Huligar, a proud member of the NSRA is willing to conduct a very important test in his own home. This is a test that can ultimately change the world of granite, as we know it. natural stone incloude granite and marble are important material in building constractions and house decorations.